"At a festival, in the sun (but still in my wellies), with friends." "Seeing a new country. Preferably something cheap and cheerful with good culture and good food lager." "Leona Lewis – Bleeding Love. It really plays to my vocal ability…"
"The Cheeky Girls. I’m not sure I should be admitting that." "I have a terrible imagination, so Tigger because he’s always happy and bouncing around the place." "Talking, especially talking loud! I can literally give myself a headache." "Brownies and ice cream. Everyone has a second stomach for brownies and ice cream!" "People who are interesting, fun and kind." "People who eat with their mouths open and also people who don’t tidy up after themselves. Grr." "My girlfriend paid for us to go to Disneyland Paris for my birthday as I had never been before." "Leonardo Da Vinci, Leonardo Dicaprio and Michael Jackson." "Being productive at work, good food and getting to sleep early. These questions have really helped me identify how actually boring I am!" 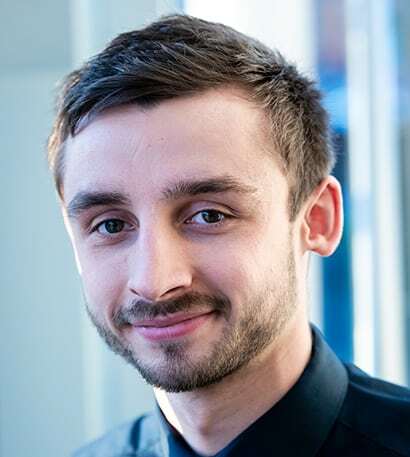 Louis joined PenLife in 2014, after a eureka moment of deciding he wanted to work in finance. He started as an apprentice and worked up to become a member of our Dedicated Support team. He’s also the leader of the paraplanning team. Louis’ day-to-day role involves managing everything concerning his adviser and their clients. He responds to client queries, completes admin and paraplanning. Because Louis is training to become a Financial Planner, work and study take up a lot of his time! When he gets the chance, he loves visiting new cities with his girlfriend and going to festivals with friends. He’s a keen traveller and took two months (thanks to his amazing bosses) out of work to see a large part of South East Asia back in 2016.